Being Retro: For Your Friday Facebook... Follies, for Friends who don't Facebook! For Your Friday Facebook... Follies, for Friends who don't Facebook! 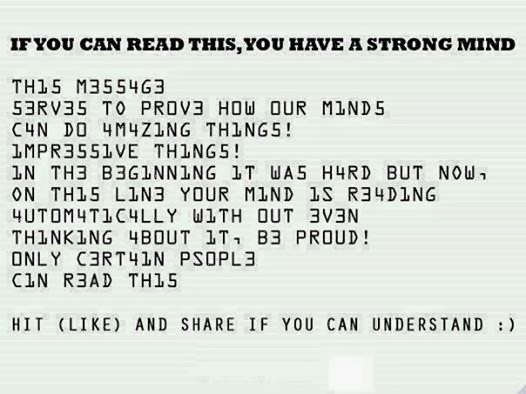 I can read it! Not on Facebook so I can't like it though. once I started scanning it with my eyes fast enough I would read it. I have a Facebook account, but found out my wife shares all the same friends as me, so I just use G+. I've seen another version of this and it's rather trippy what our brains can do...cool share. Read that without a problem - but what 'certain' people can read this? I'd imagine, withtoday's texting society, that would cover just about every teenager throughout the world who is using a mobile or smart device. Geez, and there was I thinking I was something special... pffft! Oh yes, Jeremy, I chose (G) for my A-Z category, but I'm thinking I'd rather change it to the writing subject - how does one do that, or am I doomed?